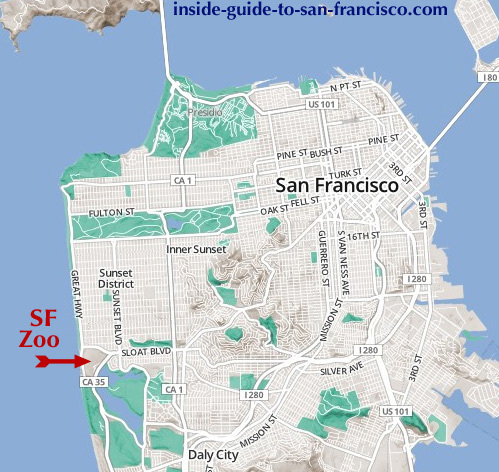 A local's tips for visiting the San Francisco Zoo. 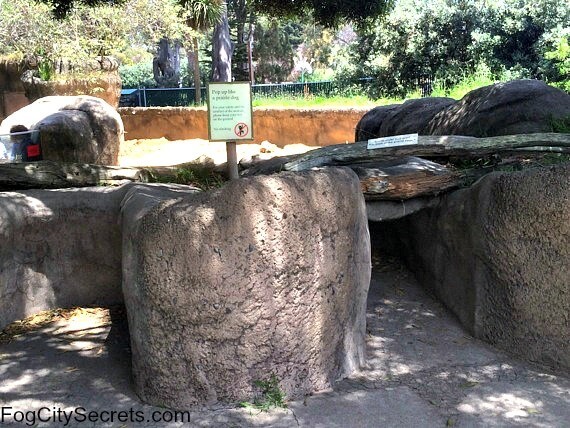 The SF Zoo has been a favorite of Bay Area kids for many years; there's lots for adults to enjoy here, too. 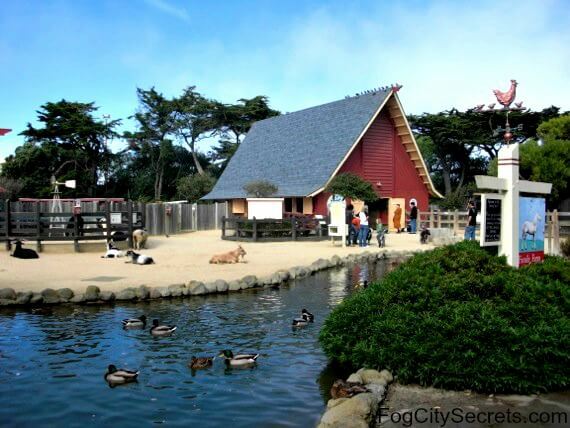 The San Francisco Zoo has been located at the end of Sloat Boulevard at Ocean Beach since 1929. 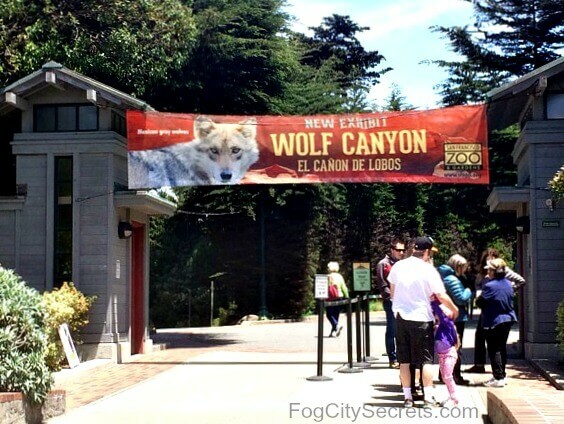 It's been evolving over time from "animals in cages" to mostly animals in natural settings; the SF Zoo has a way to go, but they have been steadily adding imaginative exhibits. It's definitely worth a visit, and kids have a great time. 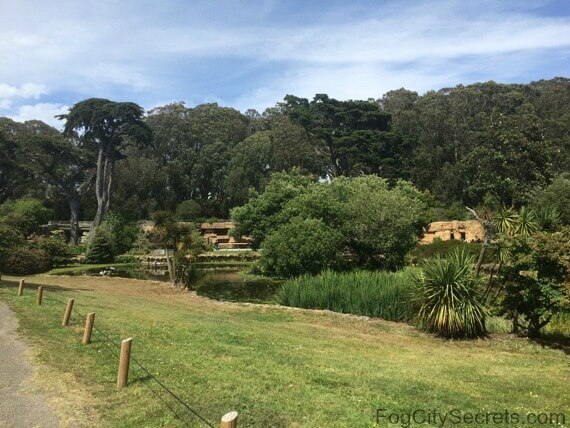 The San Francisco Zoo sprawls over 125 acres of park-like grounds and includes a carousel, steam train, playground, and a special children's zoo, along with the animal exhibits and eating places. Wolf Canyon: the latest addition. The zoo's newest exhibit has been created between the polar bear and grizzly grottos in Bear Country. A southwestern-style environment has been built to house three Mexican gray wolves. The Mexican gray wolf almost became extinct in the 1970's. At that time, a small number of wild wolves were captured in Mexico and became the start of a program to breed them in captivity to build up their numbers. There are now several hundred in the wild and about the same number in captivity. These three wolf brothers are part of that program. They were hiding when I went; understandably, since it was their first day at the zoo. I won't list everything at the Zoo; the SF Zoo has all the "usual" animals. I'll just mention some of my favorite (and my son's, when he was little) exhibits and activities. 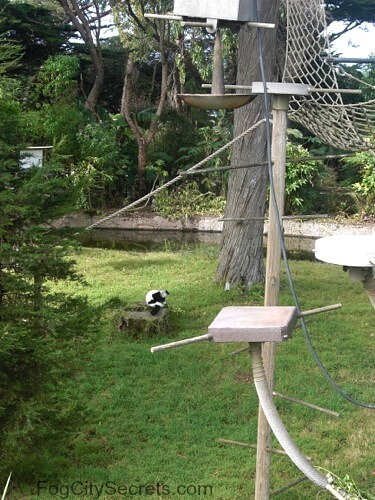 A vast forest world of tree houses, swings and hammocks has been created for four species of lemurs. The humans have an elevated walkway to see the residents, with some lemur tunnels running under their feet for close-up views. This is great fun for kids (and others)! 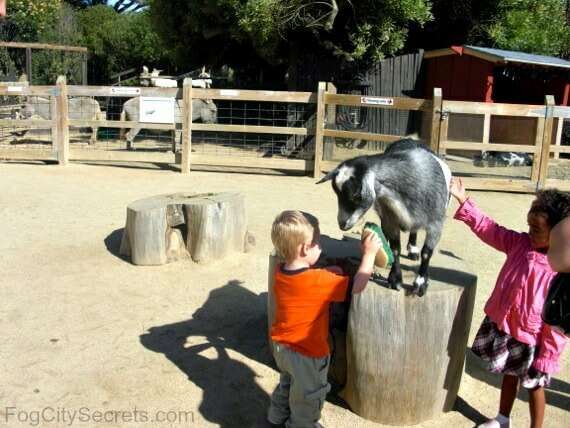 There is a farmyard and barn area with goats, donkeys, llamas and sheep to pet and feed. 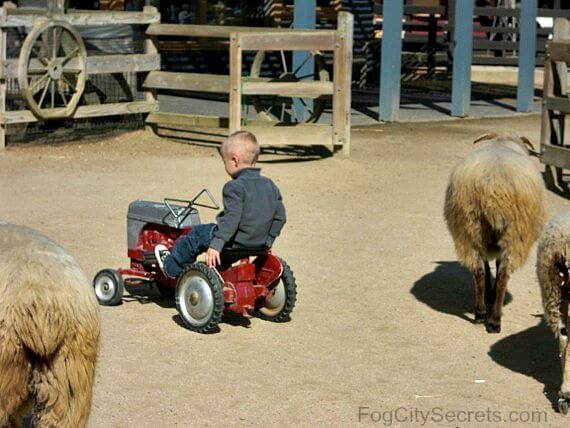 There are toy tractors to ride around on and hatching chicks in incubators to observe. The Insect Zoo is popular with kids, but I almost can't bear to go in there. Creep yourself out with the hissing cockroaches and admire (!) the world's largest spider (you won't believe how big it is). 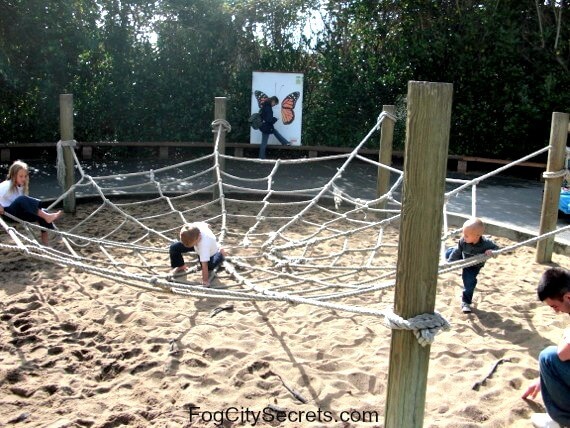 My son loved the giant rope spider web for climbing outside the Insect Zoo. 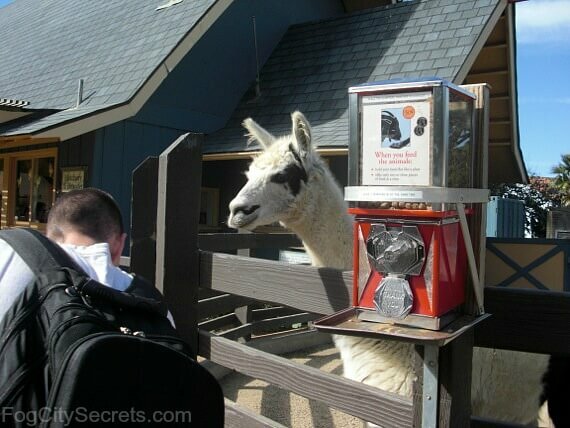 You can buy a handful of food from the vending machines for a quarter. Watch the penguins swimming around and waddling in and out of their little caves on the island. Feeding time is worth showing up for; their keeper gives a brief talk while handing out the fish individually. 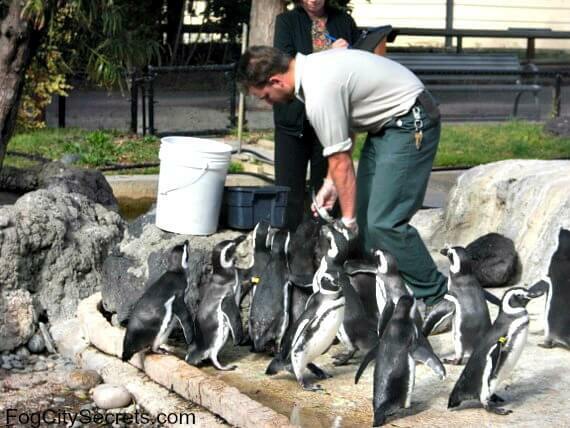 All the penguins have names, and the keepers can recognize every penguin by sight. They keep track of who eats how much at each feeding. 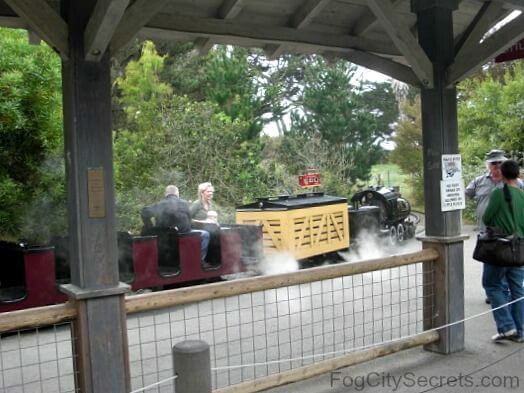 Ride in open cars pulled by a miniature steam engine, which takes you through part of the park. Fun for adults, too. The one hundred-year-old "Little Puffer" is one of only three 22-gauge steam engines still running- in the world! I love hearing that nostalgic train whistle. Exquisitely carved wooden horses, lions, dragons and cats to ride on; the original colors have been beautifully restored, with 1000 hours of work per animal. 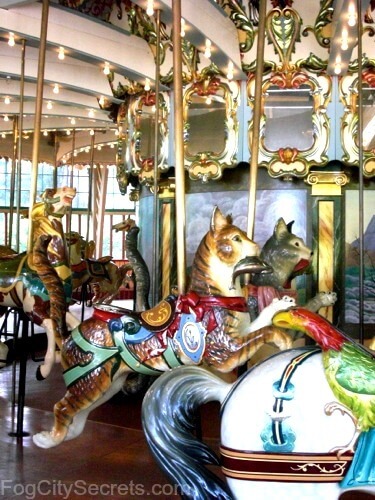 Created in 1921, this carousel has been here since 1925. Check out the strange faces carved on the frame up above. The lions and tigers are normally in open grottos, but are often brought into the caged areas of the historic Lion House. You can stand three feet away from the big cats and look into their enormous green eyes. The roaring inside the building can shake your whole body! Too bad "feeding time" for the lions and tigers was discontinued; you can still see them up close, but not on a schedule. 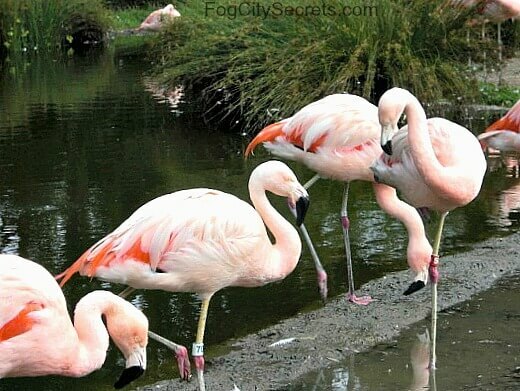 The following animals do have scheduled feeding times: penguins, grizzly bears, pelicans and giraffes. Check current times on the SF Zoo website. 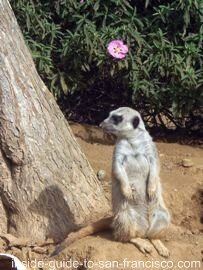 Meerkats: Could any creature be more adorable? One of them is always standing guard on a realistic termite mound. There are little windows to see into their underground burrow. The Otter River: A cement structure simulates a river with a waterfall; you can watch them playing in the water with their buddies. Prairie Dog Town: Kids can crawl through a tunnel and pop up inside the prairie dog village. Lots of activity in there. 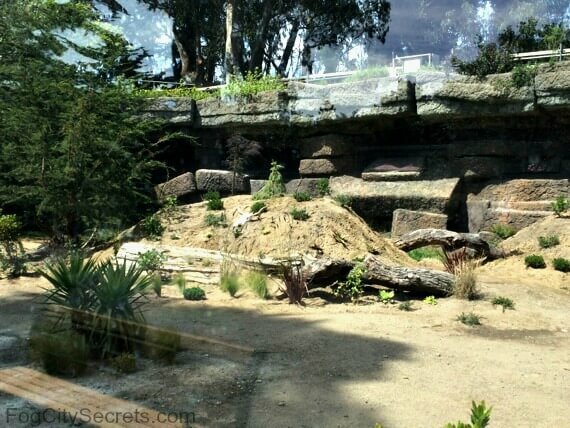 The San Francisco Zoo made international news in 2007 when one of the Siberian tigers escaped from its open-air home on Christmas day and killed a visitor. There was a lot of controversy at the time about the height of the walls (and whether the tiger was provoked). Since then, the walls have been raised and a plexiglass barrier erected in the viewing area. Previously, none of the big cats had ever escaped in the 40 years that structure had been there. 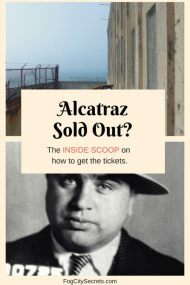 Here is an article in the SF Chronicle about the tragedy. There are always some interesting extra programs going on at the Zoo, like nocturnal tours, bicycle tours, and overnight camping. 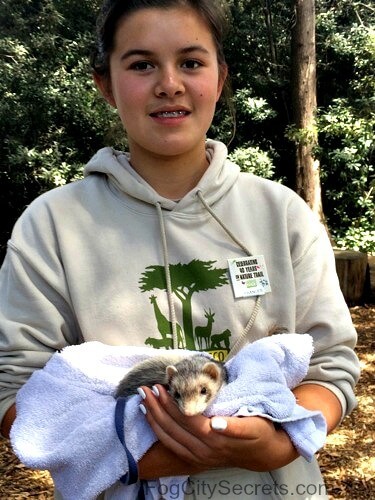 Summer volunteer positions are often available for teens. 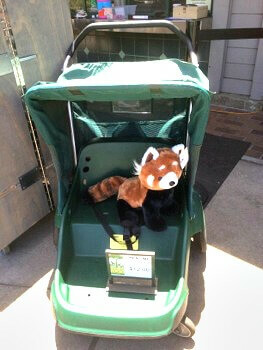 Check the SF Zoo website for current events. During the summer, local students are present in the Nature Trail area of the Children's Zoo to display various animals and discuss them. I loved getting to pet this adorable ferret! The Storybook Keys are back. Many San Franciscans have fond memories of the plastic zoo keys that unlock a story about the animal nearby. You can pick them up at the entrance (the old keys don't work now). The zoo playground has been completely redone and is really cool! Banyan tree climbing structures, a river and the North Pole; very imaginative and fun. Kids can spend hours there. Discounts for San Francisco residents: $19 adults, $13.50 seniors, 4-14 $12.50. Get $1 off if you take Muni and show a receipt or pass. Also, there are occasional free days for residents, posted on their website. Retired and active duty military, and visitors with disabilities, get SF resident rates. Tip: save $2 by buying the tickets through City Sightseeing. Cool discount. Because it's the 90th anniversary of the zoo's beginning, children ages 4-13 get in for 90 cents! Muni: The L-Taraval streetcar (catch it downtown, under Market Street) and Buses #18 and #23 all go to the Zoo. 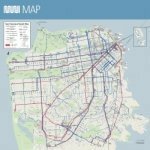 See Muni routes for SF bus routes and stops. Driving directions are on the SF Zoo website, sfzoo.org. 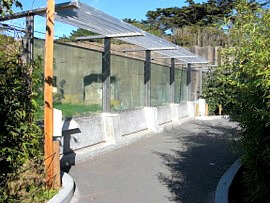 The San Francisco Zoo has a parking lot ($10; $12 weekends and holidays) with entrances on the Great Highway off Ocean Beach, and on Sloat Boulevard near 48th Avenue. Insider Tip: Unless there are mobility problems which make it difficult to walk more than half a block, there is no reason to use the lot. 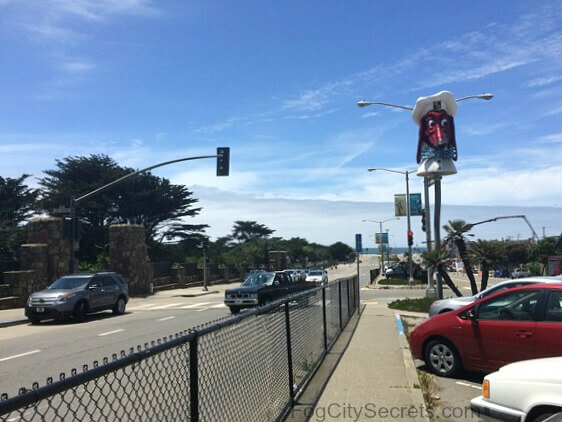 There's plenty of parking in the free lots along Sloat Boulevard next to the Zoo, plus there's lots of free parking in the neighborhood (and no 2-hour limit like some areas of SF). Equipment Rentals: Strollers and wheelchairs can be rented near the entrance. Two sizes of strollers, $10 and $12. There are three restaurants or cafes inside the Zoo, with choices of salads, sandwiches, burgers, hot dogs, pizza and ice cream, as well as beer and wine. Not exciting, but OK and convenient. There is also a cafe across the street on Sloat Boulevard worth trying, the Java Beach Cafe at 45th Avenue, near the famous Doggie Diner head. Gourmet omelettes and wraps, waffles and sandwiches. If you've come with a car, you're not far from the Cliff House restaurant: just follow the Great Highway north up the beach. Expensive, but glorious views of the Pacific Ocean, especially when the sun is setting. More on the Cliff House. 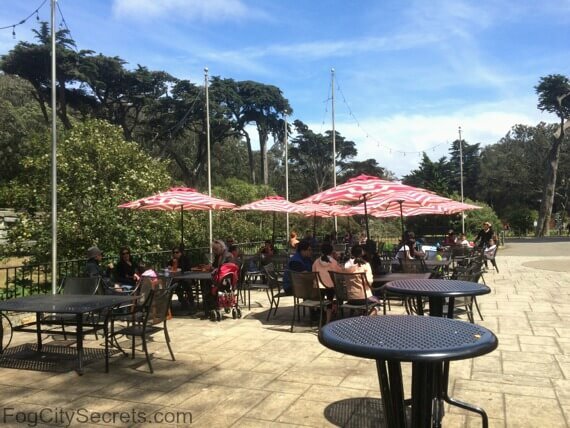 The Beach Chalet, also up the Great Highway near Golden Gate Park, is a another good place to eat. Beautiful ocean views, and good food. Try their in-house beers and admire the WPA murals in the entryway. 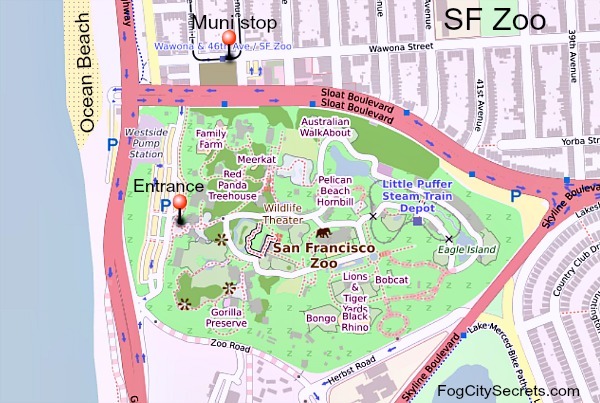 Go to SF Zoo map, where you can download a map of the grounds with a list of the exhibits to plan your visit.